While Duluthians financed the construction of the Duluth Ship Canal—with help from Jay Cooke’s Lake Superior & Mississippi Railroad to the tune of $50,000—the federal government took control of the canal after Cooke went broke in 1873, ushering in an international economic depression that cost Duluth its city status in 1877. Along with the canal and its piers, the feds also gained the two strips of land on either side of the canal. The government called the property “Canal Park,” but it didn’t do anything to make it very park-like. It made sense that they didn’t spend anything to develop the property. The Weiland Tannery sat adjacent to the waterway on the eastern side of what is today the parking lot for Grandma’s Saloon & Deli from the 1870s to the 1890s. The air along the canal would have been filled with the smell of animal skins and the acidic tannins used to soften them as the waste material from this process drained into the canal. The tannery shut down in 1895 to allow the government to widen the canal and install the concrete piers that still serve us today. Duluth was then the Lake Superior headquarters of the U.S. Army Corps of Engineers, but there was talk of moving those operations to Houghton or Marquette on Michigan’s Upper Peninsula. In 1905, an announcement by Duluth commander Major Charles L. Potter put an end to that. The federal government, he said, was going to construct a building to serve as the Corps of Engineers headquarters, and it would stand alongside the corps’ newest achievement, the Duluth Ship Canal’s concrete piers, which held a brand new engineer marvel of their own—Duluth’s brand new Aerial Transfer Bridge. 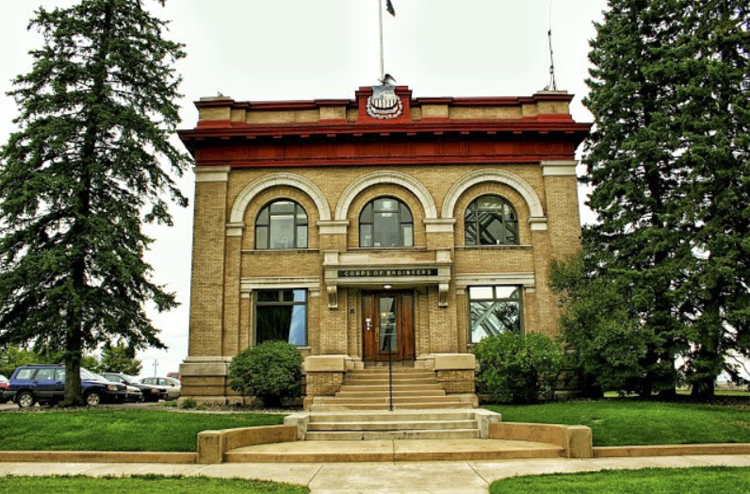 Duluth architects Wallace Wellbanks and William T. Bray designed a three-story square neoclassical office building with Doric elements faced with pressed brick and trimmed with Bedford limestone. One room in the basement was dedicated as a laboratory for testing concrete, as concrete played a key roll in most marine engineering projects of the day. Besides the test lab and offices, it included facilities for draftsmen, a photo studio, dark room, and blueprint room. It was the first building constructed for use by the Corps of Engineers in the nation. Two years before the bridge’s silver paint job, the park received an $82,000 facelift thanks in part to Jeno’s, Inc., which purchased a portion of the park to create more employee parking at its facility in the former Gowan-Lenning-Brown building. The Corps used the money to improve its own parking, fix drainage issues, create a circular drive to ease traffic, add additional green spaces, plant more trees, and improve the lighting to make the area more hospitable to visitors. The increasing tourist traffic put a strain on the bridge’s “comfort stations,” added below the bridge approaches in 1929 at the request of the Corps of Engineers, who were tired of tourists asking to use the office building’s bathroom restroom facilities. By the late 1960s the bathrooms under the bridge become so decrepit that the city removed them, turning the space into storage. Soon afterward, desperate tourists began relieving themselves in and around the park. So the Corps of Engineers decided to build restroom facilities adjacent to the Corps building. The original plans for the bathroom addition demonstrated that its height didn’t complement the existing structure, so another level was added. Someone then suggested that the extra space could house an exhibit or two about Lake Superior’s shipping history, which in turn sparked more ambitious ideas. By the time the building was completed in 1973, what had started as a simple bathroom addition had become the Canal Park Marine Museum. The museum, designed by architects Aguar, Irying, Whiteman & Moser to resemble a ship’s bridge, tells the history of shipping on Lake Superior through fascinating exhibits that range from actual artifacts of maritime history to recreations of sailors’ quarters aboard ore boats to scale models of a variety of vessels that once sailed the lake. C. Patrick Labadie served as the museum’s first curator of what has been renamed the “Lake Superior Maritime Visitor Center.” By the time the aerial bridge celebrated its one-hundredth year in 2005, more than 12 million people had visited the museum.